Preclinical imaging is the visualization of animals for research purposes, such as drug development. Imaging modalities have long been crucial to the researcher in observing changes, either at the organ, tissue, cell, or molecular level, in animals responding to physiological or environmental changes. Imaging modalities that are non-invasive and in vivo have become especially important to study animal models longitudinally. 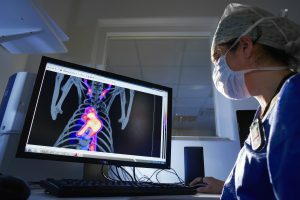 Broadly speaking, these imaging systems can be categorized into primarily morphological/anatomical and primarily molecular imaging techniques. Techniques such as high-frequency micro-ultrasound, magnetic resonance imaging (MRI) and computed tomography (CT) are usually used for anatomical imaging, while optical imaging (fluorescence and bioluminescence), positron emission tomography (PET), and single photon emission computed tomography (SPECT) are usually used for molecular visualizations. CheMatech, a leading company in the design and synthesis of chelating agents, is a full member of the scientific and economic consortium Pharm’Image dedicated to pharmaco-imaging. Through Pharm’Image we can offer you different modalities of preclinical imaging such as nano-SPECT/CT, nano-MRI.